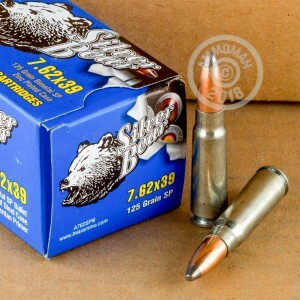 For a reliable and inexpensive multi-purpose ammunition that can be used for range training, hunting, and self defense, this 7.62x39 Silver Bear is a great option! 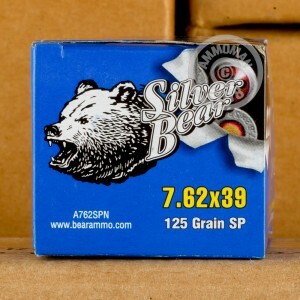 Silver Bear ammunition gets its name from the polished zinc plating that comes on the cartridge case. Typically, these finishes are only used for law enforcement, safari and specialty ammo. Zinc is a great finishing surface as it aids in preventing corrosion and extends the shelf life of the ammunition. Plus, let's face it, it looks good! This ammunition will be delivered to you in brand new condition. Each Berdan-primed, zinc plated steel cartridge contains a 125 grain soft point bullet. Soft point bullets are great for hunting or self defense as the wound created is devastating. You do not have to worry about the bullet merely passing through the target without causing much damage. If hunting or self defense really isn't on your agenda, use it for practice. With the price being so affordable, a day at the range won't cost you much. Silver Bear ammo is manufactured at Barnaul Machine Plant JSC in Russia. Barnaul Plant has a rich history dating all the way back to the period of Alexander I. Ammunition manufactured at this facility was used in both World War I and World War II. 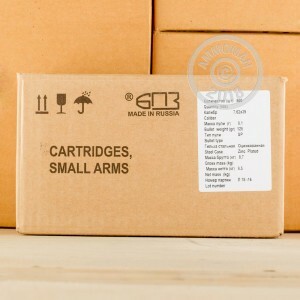 They currently supply products to America, Europe, and Asia and are one of the largest suppliers of ammunition in Russia.